The case for key projects in the Borderlands growth deal should be completed by the summer. Scottish Secretary David Mundell praised the five councils involved for the "huge progress" being made. He said they were working towards a timetable to deliver heads of terms - an outline business case - after English council elections in May. The Scottish and UK governments have confirmed funding of up to £345m is available for the deal. It covers the council areas of Dumfries and Galloway, Scottish Borders, Northumberland, Cumbria and Carlisle City. 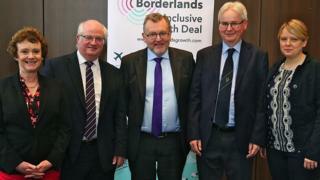 Mr Mundell told a meeting of the local authorities: "The £345m Borderlands deal has made huge progress in just 18 months. "I'd like to thank the five ‎local authorities who have worked so well together, along with the UK and Scottish governments, to achieve this. "I was also pleased to hear that following their positive experience working together on Borderlands they are keen to explore other ‎areas, such as transport, where they can collaborate." He said he hoped to see the heads of terms signed in June. "It's really important partners keep up the momentum on this," he said. A range of themes have been identified for the project including digital connectivity, energy and transport. Among its main goals is also to look at the feasibility of extending the Borders Railway beyond Tweedbank to Carlisle.